Ragnhildur Thóra Káradóttir did her undergraduate degree in Biochemistry at the University of Iceland, but for her postgraduate training she went to the University College London (UCL), in England, where she entered the Wellcome Trust 4 year PhD Programme in Neuroscience. In 2007 she was awarded a Dorothy Hodgkin Fellowship of the Royal Society, and in 2011 she was awarded a Wellcome Trust Career Development Research Fellowship. 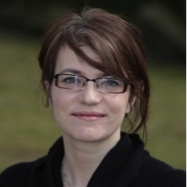 Dr. Káradóttir is currently running her own lab at the University of Cambridge, at the Wellcome Trust – MRC Stem Cell Institute. Her current research focus is to understand how neuronal activity can regulate oligodendrocyte precursor cells’ (OPCs) differentiation and (re)myelination. During her PhD and postdoc working with Prof. David Attwell in UCL, she discovered that oligodendrocyte lineage cells express NMDA receptors and that white matter OPCs receive synaptic inputs. Since starting her own lab she has demonstrated that the growth factor NRG switches the mode of myelination from being independent of neuronal activity to depend on active neurons releasing glutamate that acts on OPCs’ NMDA receptors. The CNS white matter links billions of neurons in the grey matter. Its function depends on oligodendrocytes enwrapping neuronal axons with myelin to synchronize and increase information flow between neurons: essential for our cognitive abilities, our perception of the world and our motor skills. The importance of myelin is evident in disease, as when damaged it leads to both mental and physical disability. Myelin regeneration can occur spontaneously in demyelinating disease, as adult oligodendrocyte precursor cells (OPCs; a CNS stem cell that comprises 5% of all cells in the brain) respond to the demyelinating injury and differentiate into new myelinating oligodendrocytes, thus recapitulating development. However this process often fails, making OPCs differentiation an important therapeutic target. We have previously shown that OPCs express neurotransmitter receptors and receive synaptic inputs from neuronal axons in the white matter, hence are capable of sensing neuronal activity. The lab’s interest is to understand how synaptic inputs from neurons induce OPCs to differentiate and myelinate axons during development and with normal ageing; this could be an underlying mechanism for white matter plasticity. The devastating consequences of dys/demyelination, in diseases like cerebral palsy, spinal cord injury and multiple sclerosis makes it important to study how OPCs differentiation is regulated. We are actively investigating how OPCs respond to myelin injury and whether neuronal activity and neurotransmitter signalling may regulate the myelin repair process. Our ultimate aim is to find new treatments for white matter disease.